Why Choose the Neonatal Nurse Practitioner Concentration? The Neonatal Nurse Practitioner concentration is designed to prepare the neonatal nurse practitioner student with the knowledge and skills necessary to provide a high level of comprehensive care to ill newborns and their families, patients residing in the neonatal intensive care unit, and high-risk infants and children through the age of 2. The course of study consists of 13 credit hours of core nursing courses with an additional 36 credit hours to complete the Neonatal Nurse Practitioner concentration, pending approval. 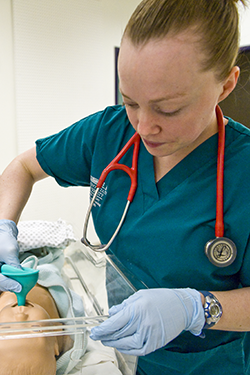 For purposes of student eligibility for certification, all Neonatal Nurse Practitioner required courses must be taken as part of the program of study while in the NNP program or challenged either by examination or demonstration of similar course content in another masters nursing program. All courses in the concentration can be delivered online in a hybrid format, making the program highly accessible to participants who have complicated work schedules and might not live in proximity to the Dayton, Ohio campus. Students have the option to take all core courses on campus. Efforts will be made to meet students' individual goals and to provide experiences in their geographical area. Clinical courses are supervised by the NNP faculty. Clinical rotations will take place at Dayton Children’s Hospital, Miami Valley Hospital, Kettering Hospital, selected follow-up clinics, and some laboratory experiences on-site at the University of Cincinnati. All students are required to complete a graduate level statistics course prior to NUR 7005: Nursing Research and Evidence for Practice course. Students can begin classes summer, fall, or spring. Individualized plans, including part-time, will be developed on admission by the director of the concentration. Please see sample curriculum plan for a full-time student. 2. Apply to the College of Nursing & Health. Have a minimum of two years full-time nursing experience in in a Level III neonatal intensive care unit prior to the start of clinical courses.